Home » Blog » Professionalism Or Personality: Which Matters More To Your Business? Professionalism Or Personality: Which Matters More To Your Business? The benefits of professionalism are well known – increased perception of respectability, authority, trust, and dependability. But is there a downside to professionalism? Is it possible to be too professional? Yes. Ahem, I mean yes sir, it is possible. Professionalism is scripted behavior which at extreme levels replaces personality; it makes businesses orderly… and boring. Why Do We Fear Marketing Our Businesses Differently? The goal in marketing is to make your business “stand out” and by definition that means being different, and having ‘personality’. Your business entity is a like a person – there are good and bad ways for it to stand out, and even more ways to stay unknown. If I asked you right now to come up with the worst possible strategy for being noticed in a crowded room, you’d probably say, “blending in.” It’s exactly the same with businesses; if you blend in, you won’t get noticed or talked about. Many people are terrified of public speaking, which is one of the more attention-heavy human experiences. Perhaps we fear this same exposure for our business? Not plain mass exposure, but harmful or embarrassing exposure. The reason we’d fear speaking in front of thousands of people is the possibility of making a mistake. Who wouldn’t love to give a rousing speech to a standing ovation? The key to overcoming the fear of being different in business is the same as with public speaking – do it and learn from it. Take the risk of leaving the professional safety zone to reap a greater reward. The reward is the most valuable marketing event in the world – word-of-mouth viral marketing. Professionalism in business is not remarkable, it’s expected. If you conduct your business professionally and deliver on your promises, you will get results from that, but it rarely translates as well into a marketing campaign or brand. If you spout off your keywords like every other company, you’ll be just another company. The best way to be a more remarkable business is to be relatable and different from your competitors. People like businesses they can relate to, and they notice businesses that are different. Combine those, and people will notice and like your business. Dos Equis has had a mind-shatteringly-good campaign for the last few years – The Most Interesting Man In The World. The ad relates to the fantasy of every man – being interesting. Their sales have risen 20-30% since the ads began, with other import sales going nowhere in the same time frame. There is even a meme about it. You can see it’s not easy. Even with their message, if they had fumbled the comedic timing or catchphrase, it may not have had the same impact. Analyzing success is easy, replicating it is not. Still, that is no reason to accept having a bland company. There are multiple levels of success, and it’s my belief that even trying and flubbing your attempt to be different in a relatable way will give your business better results than jumping on the generic carousel. 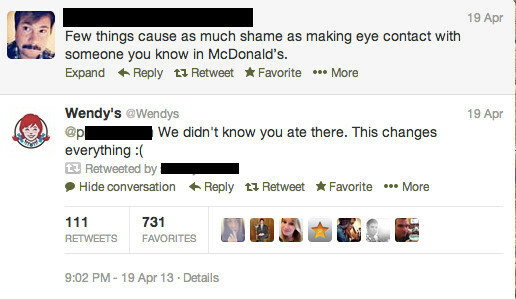 While on twitter, I came across this Wendy’s interaction. It surprised me because it completely changed the way I viewed Wendy’s. They became less of a lame Corporate chain in my mind, even though it was just the person in charge of their twitter account. This is much easier for small businesses and soloprenuers to accomplish, but how often do you see them mimicking large, faceless corporations as if it’s better? McDonald’s started out as a simple hamburger stand, not a corporate hamburger stand. Take advantage of your ability to personify your business while you’re small, because it is an advantage. I rebranded my blog, Deep Existence, from “Personal Development’s Deep End” to “Stay Focused In A Distracted World” because the former means nothing while the latter is a relatable desire/problem. I’m launching a new service business in the editing industry, but it’s different from every other editing business you’ll see. It directly targets bloggers. It could seem less “professional,” but I can tell you this – we’re going to deliver great results while making the process more educational, fun, and interesting. That is a competitive advantage. For example, let me walk you through one of the videos for Review My Post. Humor is intertwined throughout the video, without taking much attention away from the information being shared. We think it makes it more interesting and easier to pay attention to because viewers can’t anticipate what will happen next. In many of these informational/promotional videos, I tune them out because they’re similar and uninteresting to me. It’s completely unique in the editing industry. The editors and companies I’ve seen are focused on their “professional” look and wording. Another reason we’re more casual is that we’re marketing to bloggers, and blogging is traditionally a more casual medium. Bloggers crave feedback. But nobody has offered them (us) a compelling way to get it. Traditional editing doesn’t cater to a blogger’s need to be interesting and conversational while communicating their message clearly. We really want to communicate that learning and improving one’s writing can be fun and interactive. Many editing websites have bland websites and sleep-inducing copy. So while every other editor is chasing the “we’re professional and dependable” branding, Review My Post is sticking out and saying, “we’re going to help you write content that people love to read, and it will be a fun process.” And really, isn’t reader enjoyment a primary benefit of writing (unless you’re the IRS)? It is certainly important in blogging. Do you think we succeed? Let me know in the comments! 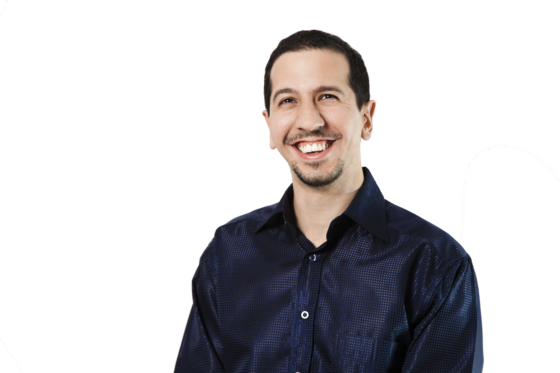 Being less professional was the right choice for our business – and maybe it is for yours too! Here are three actions you can take to be a little less professional, and a little more interesting and appealing to your customers. 1. Get into your primary customer’s head and find out his/her strongest desire that relates to your product, then position yourself as the bridge. It wasn’t until Dos Equis that a beer company really understood a rather large niche market of beer drinkers – men who aspire to live an interesting life. There are niches upon niches, and massive overlaps, but the key is to connect with a specific niche emotionally. People buy stuff to improve their lives, and especially with services, there is potential to show them a reflection of their dreams as they look at what you’re selling. I don’t know about you, but when I see even a glimpse of what I want in life, I’m ready to buy anything that brings me closer. If you’re having trouble relating this to buying beer or toilet paper, understand that these products are more than just their physical components. To some person, fluffy white toilet paper of the best quality could make them feel like they’re successful. To the guy at the bar, buying a Dos Equis might make him feel more interesting, which gives him confidence to approach a girl. Suddenly, his $5 beer is a wingman! For my company, I want bloggers to understand that they need feedback on their writing to improve their “blind spots,” and that Review My Post is the best way for them to move forward towards their dream of becoming an elite writer/blogger. It’s a compelling reason to buy an inexpensive review, don’t you think? The “dream” isn’t always a lofty personal aspiration. For example, a “dream” of mine is to find a medical facility with transparent pricing. I have to ask how much it costs to get an MRI of my shoulder, and they’ll tell me “it depends.” Instead of knowing what their service costs, I’m supposed to accept whatever they deem fair after I get the service? I have no doubt that a medical facility which advertises their prices will see an increase in patients, because they’ll meet this ‘dream’ of those who are tired of being surprised by medical bills. Of course, this isn’t one of my personal ‘dreams,’ but something that would make me a free, enthusiastic ambassador of the business. The legal portion of your website is supposed to be the only bland part. Otherwise, verbose, lifeless text does not excite anyone that I know. Make your information clear, but conversational and approachable, with *gasp* occasional humor, or you’ll sound like the IRS. Hey, wake up! You fell asleep on your keyboard. Can you imagine reading a book full of this kind of language? You’re welcome for the tax information. Maybe it’s just me, but I am always refreshed when I see a company like Glacéau. Glacéau knows that when a person sees something funny, unique, or interesting, they might just share it. Again, sorry to pick on Uncle Sam, but how often are IRS quotes shared on Facebook when someone isn’t complaining about them? I have shown people my vitamin water bottle before because the writing on the back was interesting. Glacéau got me to give them the most valuable marketing gift a company can ask for – word-of-mouth advertising. At Ed Debevic’s restaurant in Chicago, wait staff treat people horribly on purpose and it’s a popular tourist spot. You’d be surprised at how effective being one in a million can be, even if it’s in a negative way. So when I say strategically, I mean that you can’t say, “we’ll only offer onions on burgers at our restaurant,” because that doesn’t mean much to anyone and it’s not remarkable. But if you offered 45 different sauces for your burgers, that’s remarkable. Marketing affects toilet paper sales. Toilet paper sales. That means it affects everything. Don’t sell yourself short by thinking, “I sell what I sell, and people will want it or not.” People want to be sold to. They are always looking for products and services to improve their lives. Try something crazy. It worked for Half.com. When Half.com marketing VP Mark Hughes convinced Halfway, Oregon to rename their town to Half.com, the story received national press. In other words, they received national advertising for free. Half.com sells books, music, and other forms of media, all of which have nothing to do with their unique marketing idea. Half.com was sold to eBay six months later for 300 million dollars. They stood out. And the ripple effect continues, as I’m writing about them now. This is a challenge to you. It’s time to stop trading money for exposure and stopping there. Be different, be remarkable, and and you’ll get better results for free. In what ways are you more or less relatable to your target market? Have you tried doing something remarkable yet or are you playing it safe, hoping people will see that you “provide world-class customer service” and be amazed? Let’s discuss in the comments how your business is relatable and differentiated or what you plan to do to make it that way. I’m excited to hear what you think, and how you position yourself! Stephen Guise is the author of Mini Habits and the founder of Deep Existence. For more about his story, you might find this blog post interesting - it goes into the unique path of rejection (ouch!) that brought him here (where he's happy to be). Previous Post » Ask the Readers: What’s Wrong with Webinars? Food for thoughts – passing it on to the other candidates on my team for municipal elections. Great, good luck with the elections! Completely agree. Creating a brand is about taking a stance. It means that you are not trying to please EVERYONE but targeting a very specific market/group of people. At the end of the day, you can’t be everything to everyone so it is important to take some sort of stance. The alternative is Mediocrity. Well said. There is a lot of pressure to blend in, but it’s not the right path. I’m still new to blogging for my business, so I really appreciate your post, Stephen, and I’ll check out Review My Post. I use a lot of random personal stories to help convey important information in my posts, and it’s working. Every single time I’ve hesitated to include something, and then hit “publish” anyway, that’s the very thing readers have commented on, and it’s the very thing that inspires a new lead to contact me about working with me. Those unprofessional, but personal tidbits are what make me relatable. I’d also like to start creating vlogs as when I write, I inadvertently edit out my sense of humor, but I know if I get in front of a camera, there will be no editing. Stories are very effective and a good way to differentiate yourself from the many plain “how to” blog posts. Thanks Kristina! Humor in writing is very effective for engagement. Have you tried leaving your humor in and seeing the response? and now for something completely different… I walk around with a GIANT leg on my back. LOL!!!!!!!!!! So does that give you a “leg up” over everyone else? (Thnk La Quinta Hotels). My thing is a patented, hands-free & interchangeable carrying case system called PortaPocket…keeps your small & important things handy, safe & CLOSE. (ID/$/cards/cell/passports/medical devices/etc). Great for tampons too not that you need ’em 😉 …an excellent antidote to that NFL bag ban (if you’ve heard female fans screaming all over social media)! thanks Stephen, and exactly! Why not? Of course there is method to the madness and that is to get people thinking. And asking themselves wth is that chick doing. Curiosity = must ask = conv0 = understanding. Hallelujah! Many people think my PortaPocket was that leg garter product they put on Shark Tank on abc last year. But it’s way more than that. But at least my giant LEG makes them “get ” that you can wear it on your LEG. Sometimes you have to kick people in the head (in a nice way) to get them to “get” common sense. At least with the NFL situation, PortaPocket should finally get a bigger bullhorn.. we’ll see. Just stop by http://www.portapocket.com to see more. btw… my last webguy bailed so if you know someone with zencart and php knowledge please send ’em my way. Need to get back on that site to make fixes & add a whole bunch of other things STAT! Now I get it. That’s simply brilliant Kendra! Thanks for providing a great example. The fact that you wear it on your back make it even better. I don’t have a Php/Zencart person to recommend, sorry. I had a guy for some Php work, but he was just ok, and I don’t think he knew Zencart. I love the giant leg. If I was in the park that day, I would be so happy to see it. Heck, even if the leg were not connected to your business and you wrote your business name on the leg, I bet you anything it would be more effective than walking around with a big sign or something. Excellent post, thanks for digging deeper into being interesting and appealing! My pleasure Deborah, I’m glad you enjoyed it. Love the video and how you used humor and personality to convey your message and the benefits of your service all wrapped up in a really entertaining package. I bet it’s ridiculously effective. I know that when I finally did the work of figuring those two things out, I started to get much more traction online, and everything got waaaaay easier. Funny thing is, figuring out an ideal customer avatar and authentically differentiating online are two of the things I help clients with, yet hadn’t done it for my own business in a really focused way until recently. Nutso. Thanks for these implementable and highly valuable suggestions. I especially love the advice to “Get into your primary customer’s head and find out his/her strongest desire that relates to your product, then position yourself as the bridge.” Brilliant! That was a very enjoyable comment. Thank you! Some great advice. I am revamping my website in the next month and I am definitely going to read this post again during the process to make sure I get the balance right. Excellent points. Years ago, I learned (from a still-prominet on-line marketing guru) this concept of ‘personality marketing’. Since most of us are in pretty crowded fields, emphasizing certain unique aspects of ourselves & our lives makes us stand out more. These qualities don’t need to be strictly business-related. For example, if you train therapy dogs, or perform magic, letting your audience know about this will make you more distinct & memorable. This idea of being less ‘business like’ & more authentic is an incredibly powerful — and more natural & less complex — way to grow our audience. Great advice Nancy. The challenge in this for me is always, “they’re not interested in me, only my ideas.” Of course, that’s typically false because humans are social and interested in each others’ stories, not robotic droids who only want answers. Great ideas for any scale of business. Thanks for the share and inspiring. This is a hugely enjoyable and informative post Stephen. Seriously though, it makes a lot of sense. If appearing less than ‘overly professional’ and letting our personality shine through rules out a tranche of customers, then they were not a good fit in the first place. The customers who are drawn to us because of / in spite of our quirks are the right fit. That’s especially important for solo-preneurs where we ourselves are ‘the brand’. Love your examples and observations. Well-researched and filled with helpful information for all of us, large- and small-scale businesses. Enjoyed your article start to finish, thanks! Haha, yeah that “Brilliant!” campaign did pretty well if I remember correctly. You’re welcome, Jim, and I appreciate your comment. Hey everyone, the Wendy’s conversation is actually missing the first part – here is the link to the full conversation (where Wendy’s shows some personality). ahh…that’s better… now I get it…! Great post. Even better, you new business is a brilliant idea and I need it. I tried to sign up, but it says I need an access code : ( which makes me very sad. Can Firepole’s faithful readers have a code? Of course you can have a code! The access code is actually on the sign-up page (see it?). Hi Stephen, i love the dept in your article. i write for fish and poultry farmers. do you think i can get some humor anything across to those folks and it will work? I think humor can be used for almost any niche if applied correctly. Your situation depends on how well you know your fish and poultry farmers. If you know the topic well, you can use the idiosyncrasies of the profession for humor. But it really comes down to knowing your target reader, and personally, I don’t know much of anything about fish and poultry farmers, so I can’t say that using any specific form of humor like sarcasm is the best way to go. One thing I’d recommend is that you don’t let humor steal or detract from the core message. Humor should blend in seamlessly so that it adds to the content, rather than pull the reader out of it. Best of luck and skill with your new branding! I’ve been contemplating letting one or two of my blogs go, but I think a revamp could work instead. I need to re-brand and re-position my blogs, which means I must spend time finding my *ideal* reader. I don’t know how many blogs you have, but it might be a good idea to let one or two go if it allows you to focus on fewer projects. My blog is about focusing, if that explains anything. 🙂 Either way, best of luck and skill to you! One thing I find challenging is that to be totally brilliant and unique, it has to be authentic. I hate seeing marketing schemes or messages where it’s obvious that the minds behind it are trying too hard. Right now I’m working on a branding concept for my copywriting business. I’m completely in the brainstorming phase, and I’ve been having this feeling that maybe I have to be willing to just completely be my own unique self. Not sure totally how to do that in business yet, but I think if I can tap into that uniqueness without fear, the branding will flow. BTW, I love your concept for Review My Post. Totally rad!